On June 10, 2016, in the city of Bratsk, within a park zone near Krupskaya Street, was put into operation Salochki amusement fountain. 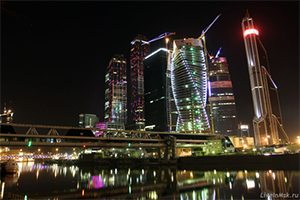 The construction of the 4 fountains in the "Moscow City" was end. An engineers from group of companies "Borond" are carried out commissioning and configuration of the main pieces of equipment fountain now. 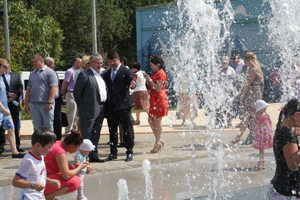 In the square of the 60th anniversary of the USSR in the city of Kirov was inaugurated fountain "Romance-3." This happened on August 23. The event attracted a lot of people - locals with kids, top officials of the city and the region. The discovery of the object was timed to celebrate the "Day of romance" in the Kirov region, dedicated to the birthday of writer Alexander Grin, who was born in Kirov. August 7, 12-00 at "Himki Arbat" was open the fountain "KRESTIKI-NOLIKI". Fountain of the series "Beautiful City" production of GC "Borond." The fountain was built in less than a month. 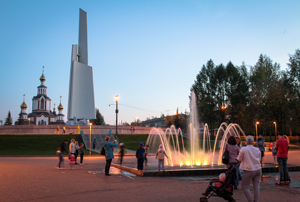 June 12 in Kirov was inaugurated Light-Fountain "Cvetok", one of "Beautiful Town" by GC "Borond." The fountain is located in Victory Park. Victory Park is a favorite place of citizens. At the opening were Governor Nikita Belykh, the head of the city of Vladimir Bykov, members of the administration, the government and the Legislative Assembly, residents and visitors of the Kirov. In July 2015 residents and visitors can enjoy Moscow's big projects of GK "Borond." 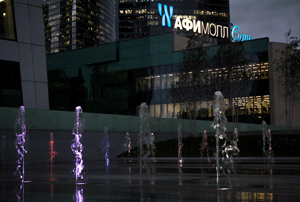 Four unique fountains will decorate the entrance to the Tower of "Evolucii" in the "Moscow City". Construction work is underway now. 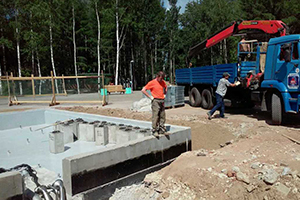 Construction of the fountain "Flower-M" in Kirov will finish. The fountain is located in Victory Park. Victory Park -the most favorite place of citizens. This commissioning is going to be this week. 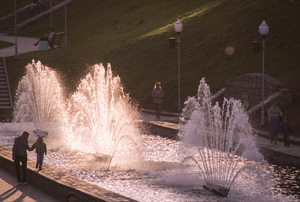 Opening of fountain will be dated to the Day of the city of Kirov. It will take place on June 12th 2015. 14 February 2015 were the opening of the fountain in the shopping center "Columbus" near the metro station named PRAGSKAYA. 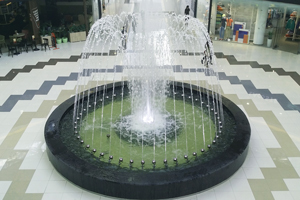 The fountain is located on the first floor of the shopping center next to the glass elevator. The fountain perfectly fit into his style, and Light-jets game was attracted the attention of visitors and special guests. In December, 2014. in Mikhailovka to finished the construction work and installation of the fountain "Krestiki-Noliki”. The startup of that unit is going by 2015. 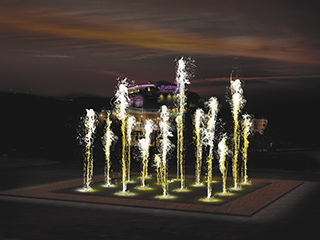 6 December 2013 was the opening of the fountain in the shopping center "Crystal". The fountain is situated on the first floor of the building. This is a real gift to all visitors. Now come to shop, they will be able to enjoy the beauty of this fountain all year. For children’s hearts it’s a very big joy .They not hide the pleasure of communicating and enjoying the beautiful water images.